The second day of a conference is when things start to get awkward. By day two, the weariness has started to settle behind your eyes, your jaded opinions of the world have returned, and you do not remember a single name of the dozens upon dozens of people you threw yourself at the day before. Enough time has also passed – and accumulated shared experience as you continue bump into each other – that you’re too embarrassed to say you don’t know their name. You play the dangerous game of trying to force an encounter between two people whose names you don’t know in the hope that they’ll introduce themselves. What this invariably means is that, if you’re me, you start to avoid people in order to circumvent almost-certain social awkwardness. The good news is that, if this happens at a science conference, there’s great research to hear about instead. This is particularly true for obesity, a global pandemic that grew slowly in front of our eyes over the last century. In 2014, according to World Health Organisation figures, there were 1.9-billion overweight adults on the planet, and 600-million of those were obese. Obesity has also been linked to many other diseases, including diabetes, heart disease and a number of cancers. Despite knowing the extent of the problems, it is incredibly difficult to lose weight for many, many, many reasons. And here was the first shock to my system (it did what the bad conference coffee had failed to achieve): by testing of thousands of people, Elinav found that the GI system held true for the average, it was not true for the individual. Upon eating a certain food and then being monitored: “Some [people] spike to near diabetic levels, others don’t,” Elinav said. But statistics give us the average, which smooths out these extremes. But how does that links to micro-organisms in our gut? “The microbiome was the biggest feature to determine the body’s response to food,” he said. Since our genetics and microbiomes are all different, that makes sense, neh? That said, there are some thing all diets agree on: moderate exercise, less sugar, smaller portions. Unfortunately, “moderation” and “balance” are seldom the words people want to hear when it comes to a silver bullet for a pandemic. There is something that science funders like to hear, though, and that is “small” and “cheap”. And that is what the Twinkle Space Mission plans to offer: a small, low-cost satellite, which aims to analyse planets when it is launched into low-earth orbit in 2018. Just over two decades ago, we thought that the sun’s planets were unique, but the Kepler mission dashed our egocentricity. These days, we’re finding exoplanets at an alarming rate and they are fulfilling all of feverish fictional dream and wishes: a planet of diamond, possibly habitable ones, even a giant one with three orbiting suns. The UK’s Twinkle mission caught my attention because, aside from the fantastic and endearing name, it is “not pushing scientific capabilities”, Tessenyi said. It feels as though everyone is trying to “push the boundaries” these days: the biggest, the smallest, the fastest, the whatever-est, how far we can see, how small we can cut. While this technological drive is great, there is a lot of important and exciting science to be done with the technology we already have. I mean, that’s why we developed it, isn’t it? GI is a measure of how quickly the sugars in foods are absorbed into your bloodstream. You can read more about it here. High GI foods can be bad because the sugars are so simple that they are absorbed into your bloodstream very quickly i.e. they spike your blood sugar, which can contribute to quicker fat storage if you don’t need all of the energy contained in the sugar right away. Spikes also lead to crashes in blood sugars soon after eating, which causes cravings for more sugar, leading to a cycle that fuels obesity. Over the long term, high blood sugars put strain on the body’s insulin response, which may lead to type 2 diabetes. Low GI foods are considered healthier because the sugars therein are complex and take longer to break down, thus getting absorbed into your bloodstream slower and providing sustained energy over a longer time rather than in one quick burst – that’s the “fuller for longer” idea. 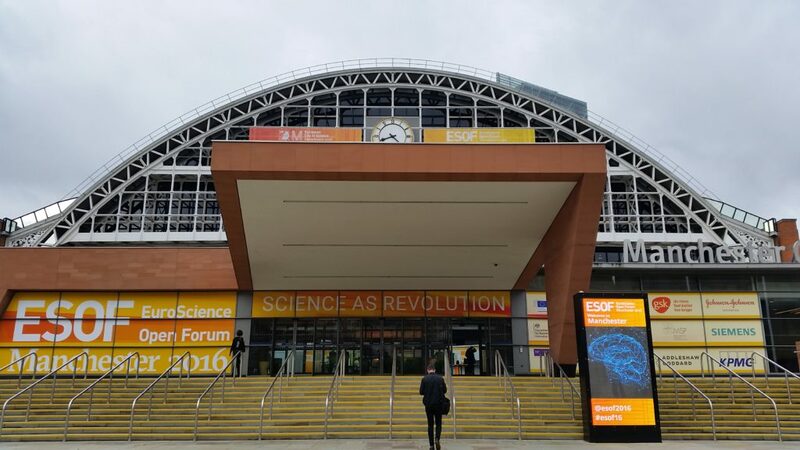 The fine print: I am at ESOF16 thanks to a Nature Travel Grant, and my accommodation is covered by the SKA Organisation. It can happen in the blink of an eye: millions of light years away a star collapses in on itself. From Earth, that cataclysmic event is only a sudden brightening of a point in the night sky, and on the ground, astronomers scramble to investigate it. A new telescope, to be installed at South Africa’s Sutherland astronomy site in the next year, will catch these faint flickerings, among others, and help us understand more about what is happening in the universe. But what makes it different from other optical telescopes observing these transient astronomical phenomena in Sutherland is that the MeerLicht (“more light” in Dutch) telescope will be linked directly to South Africa’s MeerKAT radio telescope, more than 200km away. “This is a novel way of doing things – creating a real-time link with optical and radio telescopes,” says Patrick Woudt, head of astronomy at the University of Cape Town and South Africa’s principal investigator on the MeerLicht project. For more, you can read the rest of the story here. 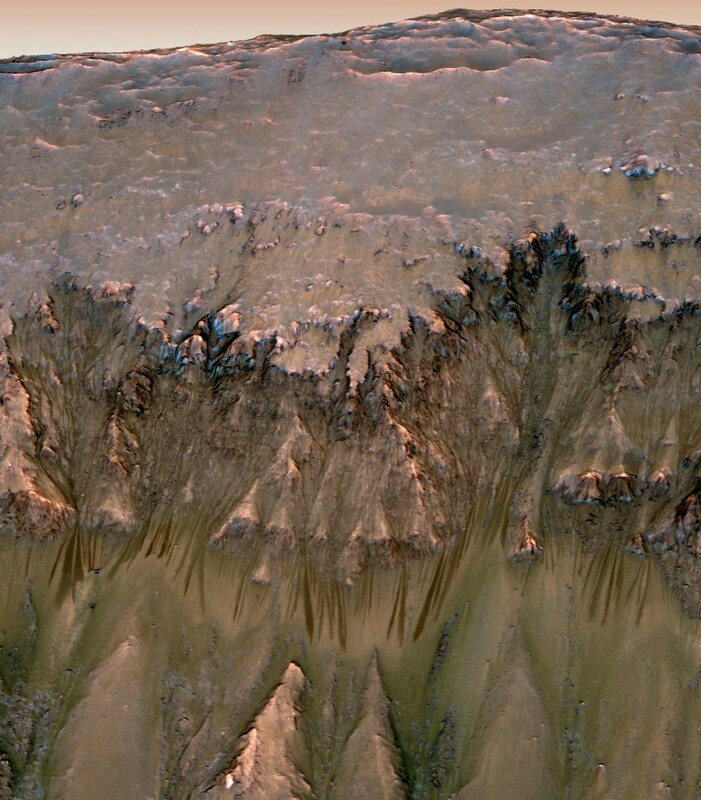 Liquid water may flow on present-day Mars, the United States’ National Aeronautics and Space Administration (Nasa) announced on Monday. Liquid water is necessary for life as we know it, and its discovery on Mars adds to the evidence that the red planet could support life. Carbon-based life exists on Earth because it is in the “Goldilocks Zone”: if Earth were closer to the Sun, water would evaporate; further away, the water would freeze. However, Nasa’s discovery of hydrated minerals means that there could be life on the fourth rock on from the Sun. “Warm” for Mars is when the temperatures are above minus 23-degrees Celsius. Using instruments on board Nasa’s Mars Reconnaissance Orbiter, which has been orbiting the planet since 2006, scientists detected hydrated minerals in these streaks. These substances form when minerals combine with water. “The detection of hydrated salts on these slopes means that water plays a vital role in the formation of these streaks,” said the Georgia Institute of Technology’s Lujendra Ojha, who is lead author on the report of these findings, published in journal Nature Geoscience. Ojha first noticed these intermittent streaks in 2010 when he was an undergraduate. We have long known that Mars has water on it, but it is in the form of ice, rather than liquid water – the planet has two polar ice caps containing millions of cubic kilometres of frozen water. But it is also thought that the planet once had large quantities of liquid water, which moulded the ancient face of Mars. However, Nasa’s announcement has raised a number of interesting questions, with scientists from around the world questioning how it would be possible for liquid water to exist on the surface of the red planet. Additionally, it is not known where the water comes from, or if there is life at or near the streak sites – and rovers cannot go there. In response to a Reddit “Ask Me Anything”, initiated as part of the announcement, Nasa Jet Propulsion Laboratory’s Rich Zurek said: “Because liquid water appears to be present, these regions are considered special regions where we have to take extra precautions to prevent contamination by earth life.